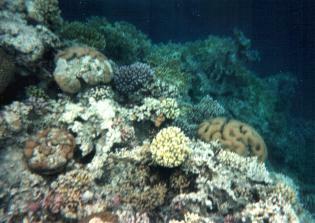 DAHAB - RED SEA, OCTOBER 2004 - We were staying for 5 days in Dahab in Sinai, on the Red Sea coast. This place is often referred to as the Ibiza of Egypt. But we found it a very relaxing place, an ideal base for trips into the surrounding mountains, learning about local culture, and of course swimming and snorkeling. It was our first snorkeling experience and it was really and eye opener - the beauty of the underwater world is truly amazing ! 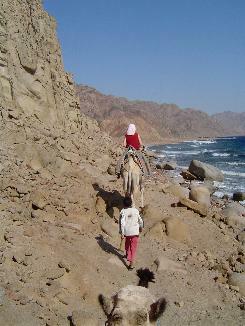 On one of the excursions we made, we started in a place called 'Blue Hole', near Dahab, and from there on , the only way further is by camel or by foot - but we even encountered one mountain biker ! Like so many situations in the world, also here exists no clear answer. All of the bedouin people used to be nomadic people, trekking with camels in the Arabian desert. 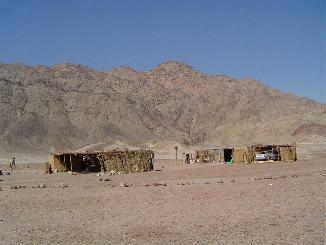 Although a lot of the bedouin live nowadays in a 'modern way', the bedouin culture remained alive in the Sinai. The bedouin are one of the most hospitable and enjoyable people we met during our stay in Egypt. When we arrived in the village - which lives of course mainly from tourists and divers - we were welcomed with the typical bedouin tea, which tastes just great and is really bringing energy - in fact some herbs are used that bring this effect. In any case, this is the best tea of Egypt ! The food these people made for us was not only delicious, there was also plenty ! Of course they also tried to sell some stuff, but without being agressive sales people , like in the rest of Egypt. So we went a lot of snorkeling, and this place was just fabulous ! As soon as you get into the water and put your head under water, you are in a different world, a world of colours and full of life. We saw many of the species which were in our book, even the poisonous ones we discovered later in our book. Main rule stays: don't touch anything, only leave your footprints on the beach. We had our own hut on the beach, which was ideal for relaxation after swimming and snorkeling - the bedouin manage to make huts that not only protect you from the sun but also provide a natural air conditioning effect - no matter how hot it is in the sand, it is cool inside ! just great !